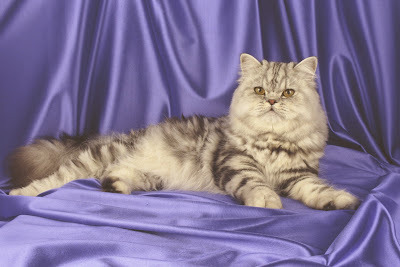 It is believed that Persian cats originated in western Asia as the result of a gene mutation. The longer coat became a survival advantage in the cold climate. There are references to long-haired cats in ancient Egyptian hieroglyphics. 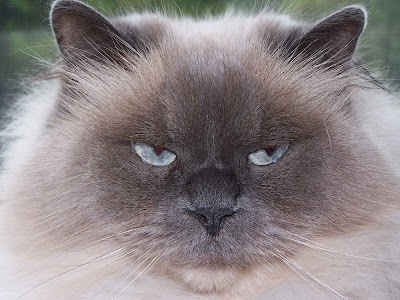 Some experts say that the longhair cats of Persia (Iran) might have been cross bred with the lushly coated cats from the Angora region of Turkey to get what we recognize as a "Persian" cat today. They started showing up in Europe during the 1500's. Documents from the 1600's have been found that show importing of these beautiful cats from Persia into Italy and from Turkey into France. These cats were used as a valuable commodity in trade. 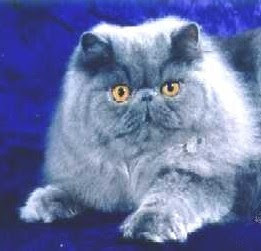 Persian cats started being exported to the USA in the late 19th century. 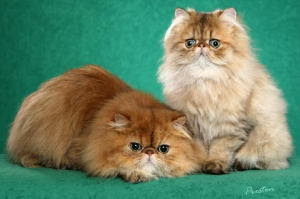 Today Persian cats are one of the most popular breeds. Over the years, I personally have owned a red tabby Persian, a white Persian, a black & white Persian, and two Himalayans/Colorpoint Persians. Below is a picture of my Ashley. She's the only one that had papers (purebred). The others were rescues. 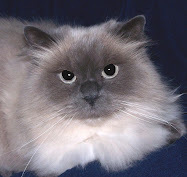 You can find Persian cat pictures in calendars, on greeting cards, in books dedicated to the breed, and on clothing. My daughter has a sweat shirt with a blue Persian on the front. These cats are admired for their great beauty. They need us humans to help them stay beautiful and healthy. An indoor environment is a must. Persian cat care includes wiping the eyes with a damp wash cloth as well as brushing and combing their coat to remove loose hair and tangles/mats every single day. A monthly nail clip and bath with diluted cat shampoo followed by a gentle drying is also recommended. Hair dryers must be set on low/cold. If the kitty is afraid of the sound, use a towel instead. It's best to start this beauty routine when they are kittens so they can get used to all the pampering. Their coats can come in a combination of every color and marking you can imagine. There are solid colors, patchwork, tortiseshell, tabby, chinchilla and pointed. The pointed coats are called "Himalayan" in the US and "Colorpoint" in Europe. These are the result of crossing Persian cats with Siamese. It's the same cat, just two different names. Famously recognizable is the Persian cat's adorable "Pansy Face." There are actually two different kinds of faces: The very flat face with a little frowny mouth is called "Ultra" or "Peeked" and the version that has a little bit more of a muzzle and large, round eyes is called "Doll" face. 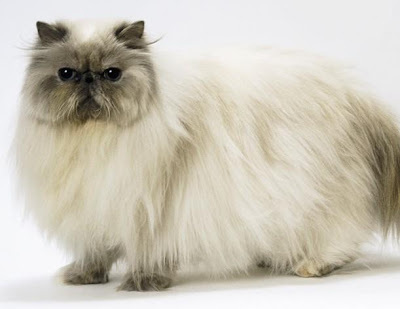 The body of a Persian cat is a little different from that of other cats. They have broad, short bodies and large heads. Their short, heavy-boned legs prevent giant leaps but they can still jump pretty good. Of course there is the shortened or almost non-existent muzzle as well as smallish ears and a straighter, shorter tail. 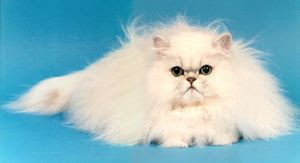 The Persian cat life expectancy ranges 15 to 20 years, perhaps more if their health remains good. There is nothing more adorable than a Persian kitten! The average litter of Persian kittens is about four. Like all kittens, they should stay with their mother and siblings until their first round of vaccinations and are fully weaned. I recommend giving a small towel to the breeder or rescue to put into the nursery box for a few weeks before the adopted kitten comes home. It'll pick up the smells of mommy, brothers and sisters and become a security blanket to help your new family member get used to their new home. Persian cats have a wonderful, gentle personality. Although they have their share of friskiness, they do not get hyper like other cats. They tend to be calm and docile, loving a home that is quiet and peaceful. Persians are very loving. Sitting next to their owner or in the lap, being gently stroked is just heaven to them.